In 2009, Montgomery County selected the Breewood Tributary for watershed restoration to meet MS4 Permit requirements . A comprehensive biological and water quality study shows that past development had degraded the tributary. Development dating back to the 1950's did not include stormwater management practices commonly used today. Over the years, the uncontrolled storm flows have resulted in erosion, pollution and poor water quality and wildlife habitat. Montgomery County, in partnership with the community, has launched a multi-year restoration initiative to implement a series of projects to reverse the damage to the stream and improve water quality. Where is the Breewood Tributary? The Breewood Tributary is located in the southeastern portion of the County near Wheaton. It flows into Sligo Creek which is a tributary of the Anacostia River. The Breewood Tributary drains 63 acres of highly developed urban area. Most of the area is single family homes, but there are also apartment buildings, town houses, schools, etc. What Environmental Problems Exist at the Breewood Tributary? The Breewood Tributary receives the most of its flow from four storm drains that convey stormwater runoff from University Boulevard, Breewood Road, Tenbrook Drive and the surrounding areas. Much of the runoff from these storm drains has no stormwater management, except for the outfall that drains from Northwood High School. Consequently, the tributary experiences frequent high flow rates during storms that continue to erode the stream channel resulting in high amounts of sediment washing out of the Breewood Tributary and impacting stream condition downstream in Sligo Creek. What is the County Doing in the Breewood Tributary? To fix the problems in the Breewood tributary, the County has implemented a variety of restoration techniques in partnership with residents living in the watershed. The goal of this effort is to restore the Breewood tributary to the “maximum extent practicable” – to make the stream as healthy as possible and help improve stream conditions in Sligo Creek. Stream restoration: Completed in May 2015, the stream channel was reconstructed to reduce erosion and improve habitat for aquatic life. Additionally, trees, shrubs and meadow grasses were planted along the Breewood Tributary to further improve environmental conditions. Breewood Manor Neighborhood Green Streets: Completed in October 2014, vegetated best management practices were installed within the public right of way along streets and roads to improve and to reduce stormwater runoff flowing into the Breewood Tributary. Bioretention: Structure at the end of Breewood Road that temporarily traps stormwater to slow it down and remove pollutants was completed in May 2017. Roadside best management practices: Structures that capture and treat stormwater from roads in the Breewood Manor Neighborhood were completed in October 2014. Parking lot runoff best management practices: Installing structures to capture and treat stormwater from parking lots at University Towers and Northwood Presbyterian Church. RainScapes Neighborhood: Working with property owners in the Breewood Manor Neighborhood to install small structures to control stormwater runoff from individual properties and promote groundwater recharge. RainScapes Projects have been installed on three residential properties to date. Community Outreach: Getting local residents involved in reducing their impacts to the stream. Monitoring: Measuring how conditions change in the stream as projects are implemented and how much improvement is made. This effort is part of Montgomery County’s ongoing commitment to improving stream conditions throughout the County and to satisfy regulatory requirements in the Municipal Separate Storm Sewer System (MS4) permit. Along with projects to reduce and treat stormwater runoff flowing into the Breewood Tributary, the County has also completed a restoration project within the tributary itself. The stream restoration project has stabilized 1,200 feet of stream channel from Sligo Creek Parkway upstream to the storm drain outfall located south of University Towers. What are the Boundaries of the Stream Restoration Project? The stream restoration project starts at the end of the rock lined section of the Fiesta Road Tributary. There was a five foot deep drop off or head cut in the stream channel which is where the restoration project begins. A portion of the stream at the upstream end of the Fiesta Road Tributary is not included in the project as the stream channel in this area is stabilized with rock and not eroding. The stream restoration ends at Sligo Creek Parkway near where the Breewood Tributary flows into Sligo Creek. How Will the Stream Restoration Project Help? The stream restoration project works in collaboration with the new stormwater management facilities being added in other areas of the Breewood watershed to capture and treat runoff before it enters the stream. New stormwater facilities have been installed along streets in the Breewood Manor Neighborhood and plans are currently in design for stormwater management facilities to capture and treat runoff from the University Towers Condominiums and the Northwood Presbyterian Church. Breewood Tributary before restoration - headcut and channel erosion. The Breewood Manor neighborhood is a single family residential area located on the south side of University Boulevard between Sligo Parkway and Dennis Avenue in Wheaton. The Green Streets project area includes only a portion of the Breewood Manor neighborhood that drains into the Breewood Tributary, north of Gabel Street. DEP has identified eleven areas in the Breewood Manor Neighborhood to install Green Street projects along Breewood Road, Tenbrook Drive and Fiesta Road. Green Street projects are roadway landscaping projects that reduce and filter stormwater runoff. Green Streets include, grass swales and tree boxes, but in Breewood Manor, the Green Streets projects are rain gardens and bioretention facilities. How Do Green Streets Work? Rain gardens and bioretention facilities are constructed in between the sidewalk and the curb, within the public right of way, at locations that avoid interfering with utilities (water lines, sewer, gas, etc.). Once installed, these facilities will provide water quality treatment for most of the stormwater runoff that flows from the Breewood Neighborhood into the Breewood Tributary. Rain gardens and bioretentions are intended to capture stormwater runoff from the roadways in small garden like areas where the water filters through plants and soil before either exiting via an underdrain (bioretention facilities) or soaking into underlying soil (rain garden facilities). In addition to the Breewood Manor Green Streets project, DEP is adding new stormwater management facilities in other areas of the Breewood watershed to capture and treat runoff before it enters the stream. New stormwater facilities are being designed to treat stormwater runoff from parking lots at the University Towers and the Northwood Presbyterian Church. Additionally, restoration of the Breewood Tributary will be completed to repair actively eroding stream banks and reduce the export of sediment into Sligo Creek and the Anacostia River. The University Towers is a 535 unit condominium complex located on a 12 acre parcel at the intersection of Arcola Avenue and University Boulevard in Wheaton. Approximately 5.3 acres of the property is impervious surface (parking lots, rooftop and sidewalks). Runoff from these impervious surfaces flows to a stormdrain system that exits the property to the south, under University Boulevard and into the Breewood Tributary. DEP has identified twelve areas on the University Towers property to install new stormwater management facilities (see map) which include rain gardens, bioretention facilities, tree boxes and permeable pavers. These facilities, called Environmental Site Design (ESD) practices, will capture and treat stormwater runoff from small drainage areas or sections of parking lot. promoting the infiltration of water into underlying soils to recharge groundwater supplies which help maintain stream flow in the Breewood Tributary during dry periods. Environmental benefits that these facilities provide will help improve conditions in the Breewood Tributary, Sligo Creek and the Anacostia River. DEP is coordinating closely with the condominium association and the residents at University Towers to locate new stormwater facilities such that they do not interfere with utilities or community use of the property. A summary of proposed retrofit facilities ( PDF, 1.43MB) was prepared and distributed to the condominium association and residents. The summary provides information about the facilities, where they are proposed and how they function to provide water quality treatment for stormwater runoff. In addition to the University Towers stormwater retrofit project, DEP is adding new stormwater management facilities in other areas of the Breewood Watershed to capture and treat runoff before it enters the tributary. New Stormwater practices have been installed along streets in the Breewood Manor Neighborhood and plans are currently in design for a new stormwater management facility to capture and treat runoff from the Northwood Presbyterian Church parking lot. Additionally, restoration of the Breewood Tributary was completed in May 2015 to repair actively eroding stream banks and reduce the export sediment into Sligo Creek. The Northwood Presbyterian Church is located on University Boulevard, between Arcola Avenue and Sligo Creek Parkway in Wheaton. Approximately 1.0 acre of the 6.6 acre parcel is covered with impervious surface (parking lots, rooftop & sidewalks). Runoff from the smaller parking lot on the west side of the church and half of the rooftop drains off the property to the west into Sligo Creek. Runoff from the larger parking lot on the east side of the church and half of the roof top drains off the property into the Breewood Tributary. Bioretention: a garden-like area where the water filters through plants and soil before exiting via an underdrain. Conservation landscaping: native plant garden. The type of facility chosen will depend on results from soils analysis. By capturing stormwater from the parking lot both the volume of water and flow rate is reduced which decreases the erosive impact to the Breewood Tributary. Additionally, pollutants are filtered out of the runoff which helps improve water quality in the Breewood tributary, Sligo Creek and the Anacostia River. In addition to the Northwood Presbyterian Church stormwater retrofit project, DEP is adding new stormwater management practices in other areas of the Breewood watershed to capture and treat runoff before it enters the tributary. New stormwater practices have been installed along streets in the Breewood Manor Neighborhood and plans are currently in design for stormwater management practices to capture and treat runoff from parking lots at the University Towers condominiums. Additionally, restoration of the Breewood Tributary will be completed to repair actively eroding stream banks and reduce the export of sediment into Sligo Creek. Breewood Manor was selected to be a RainScapes Neighborhood as part of the overall County effort to restore environmental conditions in the Breewood tributary to Sligo Creek. This neighborhood is receiving a higher level of effort and scrutiny as part of the MS4 permit requirements for restoration and monitoring. The combined efforts by the County on public land and the efforts of residents on private land are intended to restore the tributary to a healthier state and to reduce the volume of runoff and improve the quality of drainage from this neighborhood. The residential property in the Breewood Manor neighborhood accounts for 46% of the developed area of the sub-watershed. The participation of private property owners in the neighborhood to reduce runoff that would otherwise flow from the private property to the stormdrain systems is an important part of the success of Breewood stream restoration efforts. The RainScapes program allows residents to become part of this restoration success by improving the "watershed friendly" function of yards with a new focus on sustainable landscaping practices. In many older communities, a combined retrofit effort, focusing on both public land and private property will maximize stormwater treatment potential. The stormwater retrofit approach in Breewood uses a combination of green infrastructure including rain gardens and rain barrels, Green Streets bioswales, a stormwater bioretention pond, and stream restoration. The combined impact of retrofitting Green Streets and RainScapes projects is to reduce the volume of runoff and improve the quality of drainage from this neighborhood into Sligo Creek, while actively engaging residents in watershed restoration efforts. Yards in the neighborhood that drain to the Breewood tributary haev been evaluated for general RainScapes project suitability and potential. This evaluation looked at potential front yard space and drainage patterns from roof-tops and driveways. The evaluation was conducted from the public ROW - we did not need to enter private property for this phase. Of the 54 lots included in the assessment, 26 homes, or 48% have good potential for on-lot RainScapes projects. There are many opportunities for downspout disconnection - keeping roof runoff from running down the street by directing gutter downspouts into the yard rather than driveway. The outreach effort in the neighborhood has included public meetings, field walks, telephone calls, and yard signs to inform residents about the program and solicit participation among neighborhood residents. Demonstration project installations began Spring 2014. A second round of RainScapes Outreach is anticipated to occur in the Winter of 2016, with a focus on County provided sire assessments and projects being installed using the RainScapes Rewards Rebates approach. Residents who choose to participate in the RainScapes program are scheduled for a site assessment field visit on their property. At this field meeting, DEP staff or our contractor meet with homeowners to assess the nature of storm water drainage on and around the property, and where and how it could be treated on-site using a RainScapes project. Landscaping goals and preferences of the owners are also discussed at that time. Based on the outcome of the site assessment, recommendations are provided for a range of RainScapes projects that are eligible for rebate funding. The initial round of projects that are in the neighborhood were provided by the County and were intended to provide a demonstration in the community so that property owners could have close-by examples of RainScapes at work. At this time, we are able to offer site assessments for interested property owners in this neighborhood. Residents are encouraged to find out more about how to help the Breewood community and Sligo Creek watershed stormwater management effort in partnership with the RainScapes program. Please visit the RainScapes Rewards Website for information on the variety of RainScapes projects possible on private property. How Can I Participate in RainScapes Neighborhoods in Breewood Manor? If you are interested in scheduling a RainScapes Site Assessment for your property, contact DEP at RainScapes@montgomerycountymd.gov or 240-777-7702 and indicate you are in the Breewood RainScapes Neighborhood. Leave your name, address and contact information and we will place you on our waiting list for when site assessments resume in the Winter of 2016. If you have already taken steps to "RainScape" your property and reduce your rainfall runoff footprint - please let us know! You may be eligible for the Water Quality Protection Charge Credit Program , so please check the link to find out! For questions about RainScapes in Breewood, please contact Pamela Rowe, RainScapes Planner, a pamela.rowe@montgomerycountymd.gov . Stream flow and water chemistry data are being collected at two locations. The instream station is located close to where the Breewood Tributary enters Sligo Creek. Data from the 62.9 acres that drain to this location reflect all activity in the watershed. The outfall station is located upstream, slightly below University Boulevard. Data from the 16.9 acres draining to the upstream station provide information on the impacts of about 200 yards of University Boulevard, the University Towers condominiums and two smaller multi-family residential properties at the head of the tributary. At these two sites, stream water level is recorded continuously by automated flow monitoring equipment. During some storms, a series of water samples are collected by automated equipment and analyzed in a laboratory for nutrients, heavy metals and other pollutants. Samples are also regularly collected by hand during baseflow (i.e. dry weather) conditions at these locations. Data collected since 2009 show moderate levels of nutrients in the stream and low levels of heavy metals. It is anticipated that these nutrient levels will drop following restoration. If the volume of stormwater moved by the stream decreases as intended, the amount of pollutants that flow into Sligo Creek from the Breewood Tributary would be reduced, even if nutrient concentrations are not greatly decreased. In addition to these two sites, DEP is collecting flow volume and water chemistry data from runoff at the end of Breewood Road. A large bioretention is planned for this location as well as numerous small -scale practices throughout the neighborhood as part of the watershed restoration effort. Pre- and post-restoration data collected at this station will be compared to evaluate the effectiveness of these small scale neighborhood stormwater management facilities. Results from the pre-restoration monitoring show that the stream is strongly affected by the large amount of uncontrolled stormwater. During storms the stream rises very quickly and then quickly falls. The high flow levels, even in small storms, cause stream bank erosion in the tributary. The planned restoration aims to control stormwater by slowing it down so it can soak into the ground and directing runoff into stormwater management facility such as a bioretention. Getting runoff to soak into the ground will reduce the volume of stormwater entering the stream. This reduction in volume and the slow release of stormwater by the stormwater management facilities will reduce peak flow levels seen during storms. The graph below shows an example of pre-restoration conditions. After the restoration is complete, it is expected that the data will reveal a slower response in stream rise to rainfall and a longer period of more moderate flow levels during storms. This will reduce the amount of stream bank erosion and create better conditions for aquatic organisms. Current biological data indicates little life exists in the stream. Samples of aquatic bugs (macroinvertebrates) are collected annually from the Breewood tributary. The species found are pollution tolerant like the midge below. After the watershed restoration is complete, an increase in the number of species, including species sensitive to pollution is expected to be observed. This would indicate that conditions in the watershed have improved. Stream cross sections are being surveyed at two locations in the Breewood Tributary to evaluate stream channel stability. Data collected before watershed restoration will be compared to data collected after restoration to see if channel stability is improved and stream bank erosion is reduced by the restoration effort. Rainfall data are collected by an automated weather station at the Wheaton Regional Pond near the intersection of Dennis Avenue and Inwood Road in Wheaton. What causes the poor water quality in the Breewood Tributary? Much of the damage to the Tributary is caused by stormwater runoff from the impervious surfaces in the surrounding community. 38% of the drainage area (24 acres) of the watershed is unable to absorb or infiltrate water. These impervious areas include roads, buildings, sidewalks, and driveways from which stormwater travels rapidly to the nearest storm drain and down to the stream. Of the 24 acres, 15 acres have no stormwater management at all! It’s easy to see how this small tributary has been so severely impacted by runoff and erosion from uncontrolled stormwater. However, uncontrolled stormwater is not the only reason for degraded water quality in the Breewood Tributary. The actions of those living in, working in and visiting the surrounding neighborhoods also play a role. Those who live in the areas that drain to the stream can make a conscious effort to improve the condition of the stream and watershed as well. Having residents recognize their role in the Breewood tributary’s improvement has been the focus of the outreach effort in this neighborhood. DEP is working with residents living in the Breewood watershed to reduce waste, litter and chemicals in the waterways and implement methods to curb stormwater runoff. Gaining additional neighborhood stewardship including enhancing Breewood Park with benches and interpretive signs to increase its value as a local amenity. The RainScapes Targeted Neighborhoods program took on the role of identifying and addressing runoff impacts from yards, parking lots and landscaping in the area using techniques that focus on small-scale runoff management and pollution source control. 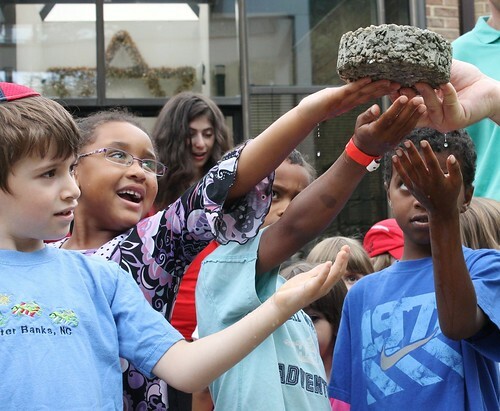 This activity involved partnering with the Friends of Sligo Creek (FOSC) watershed group and the Audubon Naturalist Society (ANS) to assist in assessment and community outreach. DEP staff meeting with residents about a rain garden installation near their home. Through this partnership, members of FOSC & ANS assessed the potential for rain garden installation on the 70 residential properties that fall within the watershed boundaries. Once completed, 23 properties were deemed as having suitable conditions to install rain gardens. After this initial ranking, the partners set out to gauge interest, and installation approval from property owners. A goal of 30% approval was sought in the neighborhood and after several years of outreach, 3 property owners agreed to install rain gardens on their property (13%). While the 30% goal was difficult to achieve, many positives came from this outreach. A few community members became advocates for the projects and helped to promote the community improvements and other activities. Several factors made the outreach effort challenging however, including language barriers, contacting appropriate property owners (renters vs. owners) and difficulties reaching households with owners that worked. FOSC was also very active in working with the Northwood Presbyterian Church on the importance of controlling runoff from the church property and its impact to the tributary. The church worked with DEP and allowed for a rain gauge to be installed on the property to better examine rainfall trends in the area. Members of the Neighbors of Northwest Branch assisting in the Northwood Chesapeake Bay Trail creation and watershed cleanup. Led by a member of the FOSC watershed group and the Potomac Appalachian Trail Club (PATC), the community came together as active participants in improving the Breewood area even prior to working with DEP. Courtesy of a Chesapeake Bay Trust grant, the Northwood High School’s Ecology Club, Cross Country program, the Neighbors of Northwest Branch watershed group, State Highway Administration and Montgomery Parks worked with FOSC and the Potomac Appalachian Trail Club to establish the Northwood Chesapeake Bay Trail. This Trail connects the Northwest branch and the Sligo Creek Parks by a natural surface trail. In the fall of 2009, an initial cleanup for the trail’s creation resulted in 10,580 pounds of trash removed from the property adjacent to the school. Another 800 pounds was removed during initial trail construction. Starting in 2010, DEP’s outreach staff joined the effort and worked to establish regular cleanup events at the neighboring Breewood Park while the final 0.5 mile of trail was blazed. Over the years, 227 community and school volunteers have donated nearly 700 volunteer service hours to this cause, removing 164 bags of trash and invasive plants from the watershed. Numerous outreach opportunities in the community have taken place in addition to the cleanups and trail creation. From 2010 to 2014, DEP has hosted and partnered with other agencies and community groups in coordinating meetings, events, tours of the nearby Arcola Ave project and neighborhood walks highlighting the restoration efforts. National Trails Day, a 5K Bay Fun Run and Hike, and the Down County Consortium Cross Country Race are just of few of the community events that have taken place in the Breewood community to further engage the public in the project and the need for restoration. Specific public meetings and neighborhood walks to engage the public have been organized at different stages of the project as well to keep the public informed of the status and progress of the project. Through all these community activities, meetings and events approximately 270 members of the public have been actively engaged in the Breewood tributary restoration over the past 4 years. Demonstrating how pervious pavement allows water to pass through as compared to traditional concrete. Portions of the Breewood tributary essentially start when rain falls on the 12-acre, 535-unit University Towers condominium complex property. Over the course of several years, extensive outreach was involved in educating the homeowners association’s board and residents about the project and why their involvement and acceptance of improvements was essential to the restoration effort.